Water resistant: 30MAT waterproof(not recommend swimming and showering). Stainless steel case with hard silicone strap. Full multi-functional:Backlight Button,Model Switch Button(Chronograph / Alarm Setting Time and Date Setting),Start Button(Chronograph Mode), Adjust Button(Time and Date Settings Mode),Reset Button(Chronograph Mode),Unit Switch Button,Time and Date Setting,Hourly Chime and Alarm Switcher. Unique and emphasize mostly on sporty style, fashion and utility design, suitable for occasions include outdoor and indoor, bring you excellent outdoor experiences. This is very useful gift for men. High quality Japanese movement with Quartz Analog LED Clock ,Calendar ,Date,Time,Minute,Second and stopwatch window display.Mineral glass helps resist scratches. APPEARANCE DESIGN :Fashion and sport casual design style, all sub-dials and hands and are functional, Full Functional Chronograph. MATERIAL:High quality Stainless steel case back and hard silicone strap with pin buckle,adjustable, durable and pratice,soft and wear comfortable. 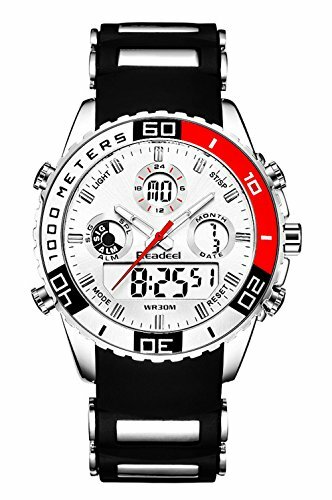 Luxury simple design watch, this is very fashion and perfect gift for men.We are try our best to provide the best product and service for customer. If you have any questions about this product by Youwen, contact us by completing and submitting the form below. If you are looking for a specif part number, please include it with your message.